There is a lot of important information about your oral health that can’t be gleaned by the naked eye. Although digital X-rays are a highly valuable diagnostic tool, their viewpoint can be limited as well in certain situations. 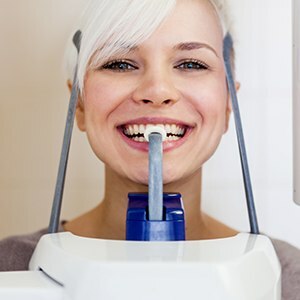 At Lakeside Daytona Dentist, we want to ensure that our understanding of your unique smile is as comprehensive and thorough as possible. That’s why we regularly utilize our state-of-the-art cone beam scanner here in Daytona Beach, FL. Please contact us today if you’d like to schedule a visit. What Does a Cone Beam Scanner Do? Our cone beam scanner will capture a panoramic, three-dimensional rendering of not just the patient’s teeth, but their entire jaw, their joints, and all of the anatomical structures in the craniofacial region. The quality of this scan is so high that it will even pinpoint finite details like facial nerves. Thus, we will have all of the diagnostic information we need to perform a wide variety of treatments, especially advanced ones like surgical dental implant placement. Dr. Silva wants to ensure that his care is as precise, as safe, and as successful as it can possibly be!